People mainly identify orthodontics with braces. But while they’re a major part of it, braces aren’t the only way this important dental specialty can make a difference in a person’s bite. For example, orthodontics can help guide the development of a younger patient’s facial structure that could head off future upper teeth misalignment. The area of focus is the upper jaw and palate (the roof of the mouth) that jointly make up a structure called the maxilla. The maxilla is actually formed by two bones fused together in the center of the palate along what is known as the midline suture running from front to back in the mouth. The two bones remain separated until puberty, which helps accommodate rapid structural growth during childhood. But problems can arise if the upper jaw is too narrow, causing a “cross-bite” where the lower back teeth bite abnormally outside the upper ones. This can crowd upper permanent teeth and cause them to erupt improperly. Using a technique called palatal expansion we can correct this abnormality if we act before the maxillary bones fuse. The technique employs a custom-made appliance called a palatal expander that attaches to the posterior teeth of the upper arch. Expanders have two halves joined by a small screw device to increase tension against the teeth to widen the jaw. A parent or the patient (if old enough) increases the tension by using a special key to turn the adjustment screw a tiny amount each day. This may cause minor discomfort that normally eases in a few minutes. The patient wears the device until the jaw expands to the desired width and then allows the bones to stabilize in the new position. This can sometimes create a small gap between the upper front teeth, but it often closes on its own or it may require braces to close it. 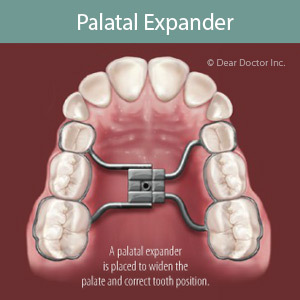 While palatal expanders are not for every case, they can help normalize development and improve the bite, and thus preclude more extensive orthodontic treatment later. But time is of the essence: after the maxilla has fused, surgery will be necessary to separate them and widen the palate. It’s important then not to delay if your child could benefit from this effective treatment.